[Top] The view from the lookout on Mount Aga. The stars look really beautiful from here on a clear night. The island in the distance is Iheyajima, where my mother was born and raised. [Center left] My favorite place: The beach near the Gitara lookout point. [Center right] My favorite place: The roof of my grandfather's house. I love looking up at the night sky from here. [Bottom left] The apartment house where we live. 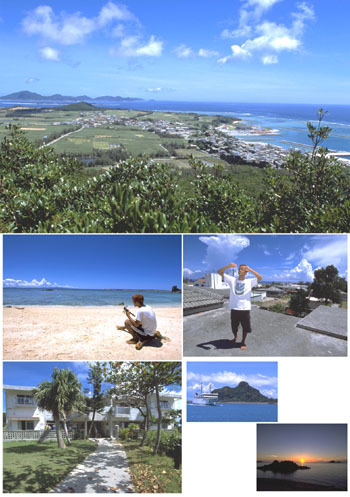 [Bottom center] The ferry from Izenajima to the main island of Okinawa takes about an hour. It makes two round trips a day. It doesn't run during typhoons or heavy rain. [Bottom right] My favorite landscape: Sunrise on the beach at Tashi. At dusk, too, I like watching the slow-fading twilight here.